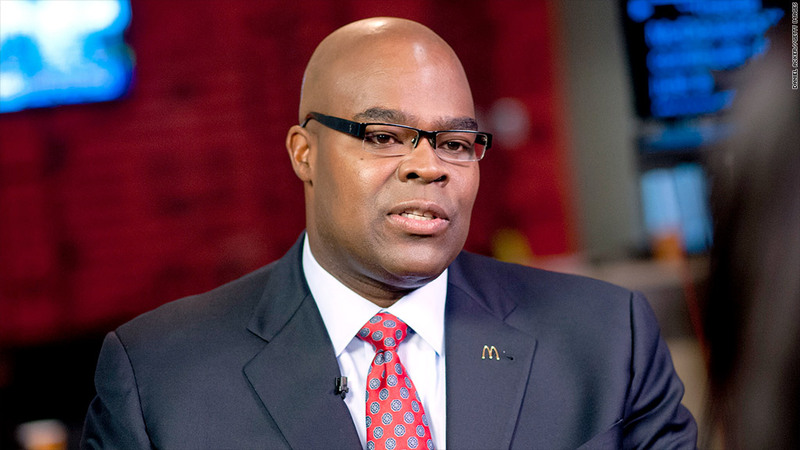 McDonald's CEO Don Thompson has reason to be defensive about a lot of things lately. McDonald's came under attack on multiple fronts, including its choice of snack for shareholders who turned up at its annual meeting on Thursday: Chocolate chip cookies. Shareholder Terrence Brady told McDonald's (MCD) CEO Don Thompson to get attendees "something better than sugary chocolate chip cookies for breakfast." Thompson said he'd look into it. These days, Thompson is on the defensive about a lot of things. Not only are labor activists protesting outside his office asking for a minimum wage of $15, but health advocates are giving him a hard time for selling junk food to children using popular athletes like LeBron James and Ronald McDonald the clown. "Ronald McDonald is the Joe Camel of fast food," said Casey Hinds, a mother from Lexington, Kentucky, who spoke at the meeting. Hinds, a member of food advocacy group Corporate Accountability International, was referring to the smiling camel used to market cigarettes to children during the 1990's. Thompson defended the McDonald's mascot, saying the company is careful in how it conducts its marketing. "You don't see Ronald eating food," Thompson said. As the meeting went on inside, about 400 protesters gathered outside to push the company to increase their wages. The protest followed a much larger demonstration on Wednesday, when 138 strikers were arrested.